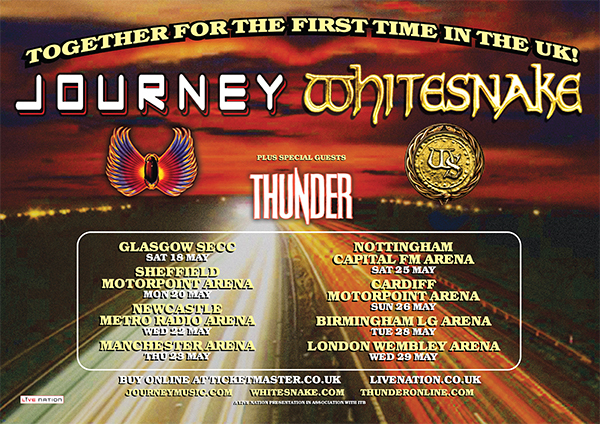 Journey and Whitesnake along with special guests Thunder, are set to appear onstage together for the first time ever in May 2013, taking in eight dates across the UK. Tickets go on sale 10am on Friday 9th November and are available from Livenation.co.uk or Ticketmaster.co.uk. Meanwhile Whitesnake say they're back with a vengeance in 2013, with plans to release a live DVD ahead of the tour as well as a double album. "Unfinished business..." as Coverdale says slyly. "We all wanted the last tour to continue as we got closer to the end...After a year in the studio we're ready to rock on stage again...We're coming back for more..."
Hi is any chance to get photo pass f Newcastle show for myself,please?